Bumgarner was born in Hickory, North Carolina, because that was the site of the nearest hospital to his parents' home in Hudson-Granite Falls. At the time, the house was a log house about 10 miles from the hospital in a community called Baton, which has a Granite Falls mailing address. After that he moved to Hudson, after which he moved to Lenoir, after which he and Ali, his childhood sweetheart/now his wife, bought their property in a community called Dudley, Shoals, which is essentially in Lenoir. Madison's father likes to tell the story of how he came to fancy the name Madison for his son: by noticing a headline in the Charlotte Observer about Madison County, located about 60 miles west of Lenoir. His mother chose it from a book of baby names. "It said Madison meant 'the son of a great warrior,'" his mother, Debbie says. "To me, that meant son of Christ. We liked that name. And right after that everybody started naming their girls Madison." He grew up with the three older children from Debbie's first marriage, Lou, Will and Dena. "We were really close growing up," Bumgarner says about Dena. "I always though of her as my sister, not half-sister." In February 2010, Madison had to fly home from spring training in Arizona, back to North Carolina after his half-sister died. Madison was 16 years old when he joined an elite travel team in North Carolina called the Dirtbags, which required that all applicants fill out a questionnaire that included these two questions: What are your short-term and long-range goals as a person; and what are your short-term and long-term goals as a player? In 2007, Madison committed to the University of North Carolina after his senior year at South Caldwell High School in Hudson, North Carolina. In Madison's junior year, he finished 12-2 with a 0.99 ERA and 120 strikeouts in 84 innings for South Caldwell, the runner-up in North Carolina's Class 4-A level. For good measure, he hit .392 with 14 home runs and 39 RBIs. In his senior season, Bumgarner was 11-2 with one save and a 1.05 ERA. In 86 1/3 innings, Bumgarner struck out 145, allowed 45 hits, and walked 11. He planned to attend North Carolina on a college baseball scholarship, but opted to sign with the Giants after they made him the No. 10 pick of the amateur draft. In 2008, Baseball America rated Bumgarner as the third best prospect in the Giants' organization. In the spring of 2009, they had Madison as the #1 prospect in the Giants' farm system. In the winter before 2010 spring training, they had Bumgarner as the second-best prospect in the San Francisco organization. In 2008, Madison had a scoreless streak of 38.1 innings—longest in the minor leagues that season. Yes, Madison Bumgarner was a slugger in high school. They're all sluggers in high school though, right? OK, true, Bumgarner was particularly so -- he first captured the attention of Pat Portugal, the scout who would sign him, with a towering home run over the scoreboard at his high school in North Carolina. On February 14, 2010, Bumgarner married his high school sweetheart, Ali, on Valentine's Day. They bought a house with 60 acres in Oak Hill, N.C. Bumgarmer wore jeans at his wedding. Madison spent the offseason before 2013 spring training building fences on his property in North Carolina. To him, that is real work. He also bought his wife a cow for her birthday in 2011. June 7, 2010: Madison was thrown out of a PCL game, suspended for three games and fined an undisclosed amount by the league because, as he walked off the field, he threw the baseball into center field. It was the 7th inning, and the umpire ran him for arguing about a pickoff attempt at second base. "Obviously it's made a bigger deal because he's Bum and an 'uber prospect,' but Bum's a great guy," Fresno teammate and fellow pitcher Joe Martinez said. "He's about as laid back as they come, but he's got a little bit of fire in him, which is good for a pitcher. A couple things didn't go the way he saw them and he got a little upset, and that's what happens. "I think it happens to everyone once in a while, whether it's on the field and visible or in the clubhouse when you're slamming your helmet against the wall." Asked if he was surprised, Martinez said: "Bum's a tough kid. He doesn't let anyone push him around. And the guy threw him out, so I think he just wanted to get his money's worth, and he got it." Madison Bumgarner's nickname: "Mad Bum." “Of course, I feel blessed to see my youngest son accomplishing his dreams,” Madison's mother, Debbie Bumgarner, said. “When he has a good game, I have a good night. If he has an off night, I take it like a Mom. When we feel like our children are hurt... we hurt. “I remember when he was playing for Augusta at the Crawdads in Hickory. I got in line and got his autograph. I still chuckle about that. I’m momma, so when I see him on TV he is still my son, but when I see him pitching a great game, it just kind of seems like a dream. “I remember when the scouts were sitting in our home and were talking about the small percentage of players that are drafted that actually make it to the Major Leagues,” said Debbie Bumgarner. “He just got there so fast that it was like we were in shock. Debbie Bumgarner said she doesn’t get to talk to her son as often as she would like to, but they text often. Bumgarner and his wife, Ali, rent a condo in San Francisco, but still like to come home in the offseason. “When he is at home, he usually tries to do some type of event or fundraiser and helped with a benefit a few years ago when someone needed a kidney transplant,” Debbie Bumgarner said. “He signed autographs and handed out pictures for the event and helped them raise money. But he’s pretty quiet about it, whether he helps one person or helps an organization. “I really don’t like to travel and I love watching the games in the comfort of my home,” she said. “The best part is I get to watch with my parents, Lewis and Marvie Abernathy. They baby sat Madison until he started school. When Madison was asked to describe his perfect off-season day, he began with this: "At daylight or before, feed all the animals." Bumgarner is the owner of 125 acres, 20 horses, and 50 cows in rural North Carolina. "He's more country than I am," said his catcher, Buster Posey, the pride of remote Leesburg, Georgia. Bumgarner countered, "Buster probably likes to talk about himself even less than I do." One day during 2014 spring training in Scottsdale, Arizona, Bumgarner and his wife were roping cattle when Madison was startled by a large snake he figured was a rattler. He quickly grabbed an ax and hacked it to pieces. When Ali, an expert field dresser, examined what was left of the snake, she found two baby jackrabbits inside pieces of it and extracted them. A short while later, the Bumgarners noticed that one of the rabbits had moved slightly. It was alive. Ali brought the rabbit back to their apartment, and for the next few days kept it warm and bottle-nursed it. The rabbit soon was healthy enough to them to release into the wild. "Think about how tough that rabbit was," Bumgarner says. "First, it gets eaten by a snake, then the snake gets chopped to pieces, then it gets picked up by people and lives. It's all true." In some ways, Bumgarner's deception runs beyond arm action or mechanics. Hailing from Hickory, N.C., a rural patch of land sandwiched between the Blue Ridge Mountains and Tobacco Road, Bumgarner speaks with a drawl and talks slowly. He does not reveal much of himself when he does. But Bumgarner is a voracious student of all things baseball. As a child, he watched Randy Johnson pitch on television and shaped his left-handed delivery after him. After arriving at South Caldwell High School as a "tall, lanky kid," according to his coach at the time, Jeff Parham, Bumgarner poured hours into the weight room. "He ended up becoming such a beast," Parham said. "He was like a man among boys. By his junior year, the size he had was just so impressive. His demeanor, the way he handled himself on the mound, he was like a professional. In 2014, Bumgarner was selected as Sports Illustrated's Sportsman of the Year. The Sportsman of the Year award has been given annually since 1954 to the individual(s) or team who best personifies the spirit of sportsmanship and achievement. In 2014, Bumgarner was named AP Male Athlete of the Year. Madison and his wife, Ali, his high school sweetheart, own 116 acres in Caldwell County, North Carolina., in the footsteps of the Catawba and the Cherokee. It is about 12 miles from Brown Mountaiun, where strange lights glow like balls of fire in the night sky, still nearly as much a mystery as they were when the Cherokee thought they were torch0carryuing maidens searnching the mountauin for their loved ones lost in battle. It is 23 miles south of Boone, a town named for legendary pioneer Daniel Boone, who established camp there, and 66 miles southwest of Mount Airy, the inspiration for television's "Mayberry." Madison was four years old when he noticed that mountain wind. During the offseason, Madison will rise each morning at daybreak and venture out in the cold to feed the 20 horses and 60 cattle, to run through the woods, to mend and replace fences, to clear brush for pasture, to ride his horses and to practice his roping, to hunt deer and coyote, to live the same quiet mountain life he has always known. January, 2015: Bumgarner, the reigning World Series MVP had to buy his first suit so that he could dress appropriately to accept his award as Sports Illustrated's Sportsman of the Year.Though Bumgarner is 25 years old, he's from down home in Lenoir, N.C. where there's not much pressure to dress for the Ritz. He even managed to avoid a similar such situation by rocking his best blue jeans at his own wedding. Apparently the Sportsman of the Year Award carries enough clout to get him to dress to the nines. Early in 2015, Madison changed glove providers, from Rawlings to Mizuno, and he landed a Jockey underwear endorsement after an appearance with Jimmy Fallon on “The Tonight Show.” But very little else will change. 2015: Get ready to feel very self-conscious about your soft, office-worker hands. Work wear company Carhartt found its perfect pitch man in Giants pitcher/real life farmer Madison Bumgarner, who stars in its latest national ad campaign. It’s very outdoorsy. Bumgarner is featured cutting down a tree and casually throwing logs around his North Carolina farm, a standard offseason day in the life of the World Series MVP. "You watch him in the weight room, and he doesn't back off," manager Bruce Bochy said. "He's really religious with his workouts and how he takes care of himself. That's how he could carry the [postseason] load that he did last year." Posey confirmed the sincerity of Bumgarner's diligence. "I think there's a difference between having a plan and coming in and really focusing on what you're trying to accomplish that day, instead of just kind of checking a box off," Posey said. "I think that's a very strong, great attribute that he has. He doesn't do anything to go through the motions." Bochy likes to observe that truly great athletes never believe they have "arrived" at a level of peak performance. Bumgarner shares this refusal to settle, which explains why he won't let 2014's postseason erode his self-motivation. "I could pitch better than that and have worse results or pitch not as good and have maybe as good of results," said Bumgarner, the MVP of the 2014 NLCS and the World Series. "I'm not really trying to take one month in my career and go off of that. I was definitely blessed to have the opportunity to have things go my way like they did. "But I want to build off the entire season, not just one month of the season. It's that way every year. I'm trying to get better every year, regardless of what the numbers have been year after year. It's nothing different from any other time." Bumgarner is unafraid of success, as his attitude toward Clayton Kershaw reflects. "I think it's pretty clear that he sets the bar for everybody," Bumgarner said. "He's so far ahead of most anyone else that I'm sure a lot of people would be OK with that." And Bumgarner believes that Kershaw has no intention of yielding his status as baseball's premier pitcher: "I would just about bet anything that he wants to be better than he is." Bumgarner is what sets the Giants apart from other teams. He's a big old country boy from North Carolina with a soft Southern drawl, a bit of a smile, and a whole lot of focus. "All he wants to be is the best at everything he does," said manager Bruce Bochy. "Not by chance," said Bochy. "There's a competitiveness in him that sets the tone for everyone else. He's one of those perfectionists. Whether it's handling horses or cattle or throwing a baseball, he wants to do it the right way. He wants to win." Ask his in-laws. They are into team cattle roping, and back in Bumgarner's high school days, when he started dating Ali, who is now his wife, they introduced Bumgarner to the event. "I grew up on a farm, riding horses all the time, but I had never roped," he explained. "I started dating my wife, and her parents roped. It looked like something I wanted to do. I fell in love with it. That's what we do all winter." And the life-like duplication was of Mad-Bum mid-delivery, with Madison posing beside the life-sized statuette, which matched up perfectly. When Bumgarner came to the big leagues, he couldn't hit. His first four-plus seasons in the big leagues, he batted .138 and slugged .192. In 2013, Bumgarner posted a .107 average without an extra-base hit in 69 plate appearances. Nobody was surprised by that. Nobody wondered, "Hey, he crushed the ball in high school, where is the power?" That's the natural course of a pitcher's career.The next year, though, Bumgarner put together one of the best offensive years for a pitcher since the designated hitter was launched in the American League in 1973. He hit .258, slugged .470 and slammed as many home runs (four) as Joe Panik and Angel Pagan combined. Next year, Bumgarner went deep five times, again out-homering Pagan. Last year, Bumgarner fell off slightly. Still he became the only pitcher in the DH era to hit at least three homers for three consecutive seasons.And now -- 2017-- it's beginning to feel right to Bumgarner. He became the first pitcher to hit two home runs on Opening Day since … well, ever. Since 1973, only 12 other pitchers have gone deep twice in any game. The last Giants player to hit two home runs on Opening Day? Barry Bonds. Statcast measures the exit velocity, launch angle and projected hang time of Madison Bumgarner's historic Opening Day home runs So yes, it's crazy. But the fact Bumgarner hit two home runs, as unusual an achievement as that is, is almost beside the point. It was the sheer fury of those two blasts that boggled the mind. The first came in the fifth inning when Bumgarner faced Zack Greinke, one of the Majors' best pitchers in the past decade. Greinke fell behind 1-2, then decided to challenge Bumgarner up in the zone with a 92-mph fastball. That was a mistake. Bumgarner hit that ball so hard that the television seemed to shake. With Statcast™, we now have precise ways of telling just how hard he hit that ball -- it was 112.5 mph. That is the hardest ball a pitcher has hit in the Statcast™ Era. Admittedly, the Statcast™ Era is pretty short (circa 2015), but it's hard to imagine any pitcher connecting with a baseball that hard. Maybe Babe Ruth. It was like a perfectly timed punch, one that knocks out the mouthpiece and makes everyone in the crowd shout "OH!" at the same time. Pitchers don't hit baseballs that hard. They just don't. .Instead, he watched the Giants fall to the Marlins 7-5 from the visiting clubhouse after being ejected for the first time in his major league career.Bumgarner took issue with home plate umpire Jeremie Rehak’s strike zone throughout his start, as the left-hander conversed with Rehak between the field and the Giants dugout after the first and third innings concluded. After a four-pitch walk featuring a pair of borderline offerings to Marlins first baseman Justin Bour in the bottom of the sixth, Bumgarner walked toward home plate and expressed his frustration with Rehak again. When Bochy decided to remove his ace following a game-tying single by Marlins center fielder Lewis Brinson, Bumgarner offered final thoughts for Rehak as he crossed the foul line, which triggered an ejection. June 2007: The Giants chose him in the first round, out of South Caldwell High School in Hudson, N.C. Madison signed with scout Pat Portugal for a bonus of $2 million. 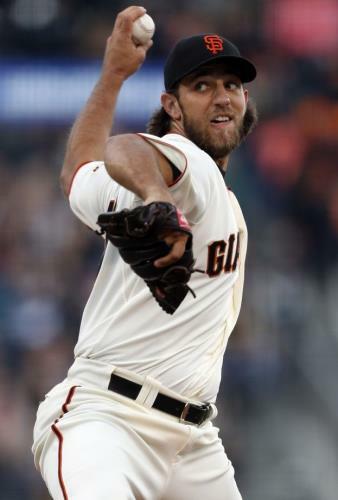 April 16, 2012: The Giants signed Bumgarner to a five-year extension, through 2017, with a club/vesting option for 2018 and a club option for 2019. The deal covers Bumgarner through his arbitration years and at least his first year of free agency. His heater has late boring action due in part because of a cross-body delivery that creates deception. He can overpower many hitters with that fastball. It is a devastating two-strike pitch when he elevates it. He learned his slider from Horacio Ramirez, a fellow starter at Fresno in 2010. Grizzlies pitching coach Pat Rice refined it. 2016 Season Pitch Usage: 4-seam Fastball: 48% of the time; Change 3.4% of the time; Curve 15.9% of the time; Cutter 32.8% of the time; and Slow Curve .1% of the time. 2017 Season Pitch Usage: 4-seam Fastball: 43.3% of the time; Change 5.5% of the time; Curve 15.5% of the time; Cutter 35.7% of the time. 2018 Season Pitch Usage: 4-seam Fastball: 34.4% of the time; Change 7.9%; his Curve 22.3%; Cutter 35.2%; and Slow Curve less than 1% of the time. Average velocity: 4-seam 91.5 mph, Change 84.2, Curve 78.2 mph, Cutter 86, and Slow Curve 71 mph. Madison evokes comparisons to former big league lefthander Chuck Finley for his tall, athletic body and smooth, easy arm action. He also reminds some folks of John Smiley, Andy Pettitte, or a young Steve Carlton. Bumgarner comes at hitters from a good downhill plane and slightly below three-quarters arm angle. Hitters have trouble picking up his heater from his high three-quarters delivery. He has some good deception. He is long and loose. The ball just easily pops out of his left hand. He is a bit of a slinger. In 2008 spring training, Madison's first camp, instructors changed his mechanics after telling him he couldn't make it with his odd delivery, in which he turns his back to the hitter, and after a long sweep of his arm behind him, slingshots the ball across his body as if throwing around the corner of a building. Madison locates his pitches in and out well, for the most part. He changes the hitter's eye level, hitting his spots with real precision. He also works up and down, throwing upstairs. Bumgarner is a competitor in the mold of Kevin Brown. He is ornery and fearless. And Madison is a perfectionist who does a lot of throwing on the side. Madison's best asset may be his mound savvy. He sets up his pitches very impressively and just knows how to pitch. If you don't get to Bum in the first inning, you probably won't get to him at all. October 21, 2014: Bumgarner ended his career-opening streak of World Series shutout innings to 21, second all-time only to Hall of Famer Christy's 28. In 2014, Bumgarner was the World Series MVP. You can make an argument that this was the greatest postseason pitching performance the game has ever seen. And a relatively easy argument at that. Bumgarner made seven postseason appearances and amassed 52.2 innings—the most innings by anyone ever, surpassing Curt Schilling (48 1/3 for the D-backs in 2001). His 1.03 ERA is "only" the third lowest all-time among those with at least 30 innings of postseason work. But the two guys he trails—Burt Hooten of the Dodgers (0.82 over 33 innings in 1981) and John Smoltz of the Braves (0.95 over 38 innings in 1996)—had a significantly lesser workload. In an evenly matched World Series, Bumgarner came on in relief in Game 7 and got the win. The last pitcher to throw four-plus scoreless innings in a World Series Game 7 on two days' rest was some guy named Sandy Koufax, in 1965, in what some consider to be the greatest game ever pitched. August 23, 2016: Bumgarner struck out his 200th batter of the season in the fourth inning, becoming the fifth pitcher in Giants history to have 200 strikeouts in three or more consecutive seasons. Among the others to accomplish this feat, three are Hall of Famers: Amos Rusie (1890-93), Juan Marichal (1963-66) and Christy Mathewson (1903-05). The fourth is two-time NL Cy Young Award winner Tim Lincecum (2008-11). As of the start of the 2019 season, Bumgarner had a career record of 110-83 with a 3.03 ERA, having allowed 1,431 hits and 162 home runs in 1,638 innings. Feb 9, 2019: Madison Bumgarner has made his feelings about the opener strategy clear. During a Q&A session the Giants' FanFest, manager Bruce Bochy revealed that Bumgarner texted him during the Winter Meetings after learning that the Giants were considering using openers this season. "If you're using an opener in my game, I'm walking right out of the ballpark," Bumgarner told Bochy. Popularized by the Rays and A's last year, the opener is a reliever who starts a game and pitches one to two innings before giving way to a more traditional starting pitcher or another relief pitcher. "My general response there is we've got to be open to different configurations of the pitching staff that we feel give us the best chance to win," Zaidi said.. "One of the attractions we have to both Holland and Pomeranz is their flexibility in pitching roles. They're guys that can start a game and pitch six innings, they're guys that can pitch the last two innings of the game, they're guys that can eat up middle innings. March 13, 2019: Madison Bumgarner will pitch Opening Day on March 28, Giants manager Bruce Bochy said. Madison fields his position well. In 2014, Bumgarner's pickoff move was rated best in the National League by every manager in the league, via a Baseball America survey. In 2014, Bumgarner hit .258 with four homers, 15 RBIs, and a .755 OPS to win the NL Silver Slugger award for pitchers. In 2015, Bumgarner took home the Silver Slugger Award for best season at the plate by a pitcher. April 9, 2016: Bumgarner proved that his power remained intact, as he connected off Los Angeles Dodgers ace Clayton Kershaw for his first home run of the season and 12th of his career. Bumgarner tied Yovani Gallardo of Baltimore for the most home runs among active pitchers and broke a tie with Mickey Welch for fifth among pitchers on the Giants' all-time franchise list. Bumgarner also remained productive against Kershaw. It was Bumgarner's second homer off the three-time Cy Young Award winner in as many years. Bumgarner ranks among 15 players who have at least two homers off Kershaw. June 2016: As we've seen time and time again, he's also quite a prolific home run hitter. He proved that yet again prior to the Giants' with the Cardinals, putting up the type of batting practice session typically reserved for position players. And as Bumgarner told ESPN's Buster Olney, this penchant for moonshots isn't something he takes lightly. No, MadBum "absolutely" wants to be in this year's T-Mobile Home Run Derby at Petco Park. Seriously. In 2017, Bumgarner hiked his career home run total to 16. That figure leads all active Major League pitchers and is a franchise record for pitchers. April 20-July 15, 2017: Madison was on the DL with bruised ribs and a sprained left shoulder. Any thoughts of the postseason for the Giants will be tempered by the multiple injuries that their ace sustained in a dirt-bike accident. Indulging in what he thought would be harmless recreation on a scheduled off-day, Bumgarner sustained bruised ribs and a Grade 1 or 2 AC sprain in his pitching shoulder. March 23-June 5, 2018: MadBum was on the DL when he sustained a fracture on the fifth metacarpal of his pitching hand, which he said will sideline him for at least four to six weeks. March 25, 2018: Madison underwent surgery to insert three pins into his left pinkie finger. He's expected to be sidelined for six to eight weeks. April 10, 2018: Madison was transferred to the 60-day disabled list.